Welcome to Clark College at Columbia Tech Center! Follow this tour to get an overview of all the services available to you at CTC, including the Information Commons, CTC's library. If your instructor requires it, print out and complete the CTC Self-Guided Tour Worksheet linked at the bottom of this section. This tour covers all three floors; you may start on any floor. At any point throughout the tour, feel free to stop by the iCommons (CTC 219) or Student Services (First Floor) to have your questions answered. Start from inside the main doors, in the first floor lobby area. Standing in the first floor lobby, look for the Courtesy Phone. Use this phone for short, local phone calls, or to contact Security, ext. 6133. Security can assist with Lost and Found, car lockouts, walkouts, and other safety concerns. 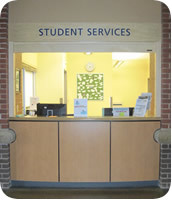 Walk over to the Student Services window, where you can get assistance with admissions, registration, global pins, etc. Be prepared to show photo ID when asking about your student information. Walk around the corner, and on the right you’ll see a counter with lots of blank forms. To the left there’s a bulletin board with important notices from Student Services. A few steps further brings you to Registration Kiosks on your right. Use these to register for classes, check student records, etc. Moving on, you’ll see the elevator to your left, a gender-neutral restroom on the right, and the Men’s and Women’s Restrooms/Locker Rooms. The 1st floor restrooms include shower facilities and day lockers. The day lockers are free —just add your own lock (you can also check one out at the iCommons). Further down the hall you’ll pass CTC 110, the Fitness Center used for classes. Keep going to see more classrooms, including facilities for the Mechatronics program. Start on the second floor, at the top of the main stairs. 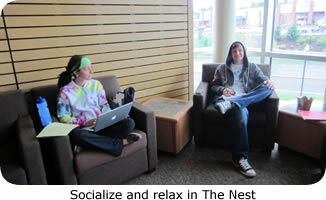 Take a moment to enjoy the seating area called The Nest, which looks out over Mill Plain Blvd. The Nest is a Community Commons, so conversation, food, cell phones: YES! The path over the stairs leads to faculty offices (no need to go in now, just be aware). Across from The Nest you’ll find the Information Commons (CTC 219), which is the CTC Library. Go on in and take a look around. In the iCommons you can: check out a laptop, calculator, reserve books; study and get help with research; print, staple and much more. Pick up a brochure and bookmarks at the iCommons service desk to learn more. ﻿ The iCommons also has two study rooms that you can book for yourself or a group. Across the hall from the iCommons is the copier room, CTC 218. Copies are 5 cents. Moving on down the hall, on the left is a row of vending machines, including one with bookstore supplies. Being as quiet as you can be, take a minute to go into CTC 212 (this new location is coming soon in Fall 2017), the Open Computer Lab. This lab is a Quiet Commons. In addition to the black-and-white printer, there’s a color printer, free scanner and a kiosk for purchasing more print credits. The seating area outside CTC 202 is a Study Commons (CTC 204). Check out whiteboard markers and erasers from Student Services. Start from the stairwell door nearest the elevator (from the second floor, this stairwell door is directly across from the iCommons). 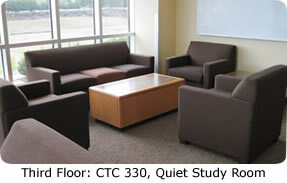 ﻿Just around the corner from the stairwell/elevator is the Quiet Commons, CTC 330. This large, glassed-in room overlooking Mill Plain Blvd. is for silent study. The large open area outside CTC 330 is called The Loft, where you'll find seating for small groups. Go around the corner and walk past more vending machines to get to the Tutoring Commons (CTC 336). The Tutoring Commons is the place where you can get free help from a Clark College tutor. 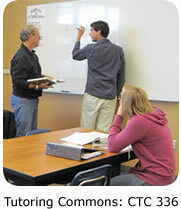 Check the posted schedule to see when a tutor is available for your subject(s). You may also use the Tutoring Commons for group or individual study, although tutors have priority use for the tables. As you leave the Tutoring Commons, head back the direction you came from and go to the other end of the third floor. Along the way, you’ll pass a lot of classrooms. Make note of three more Study Commons: CTC 304 and 310, open study areas, and CTC 312, a small room available for individual or group study, first-come, first-serve. Printable one-page worksheet to accompany the online CTC Self-Guided Tour. 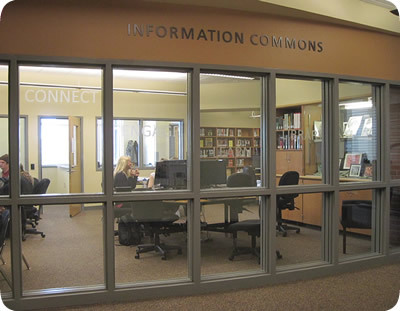 The Information Commons is located on the second floor (Room 219) of the Columbia Tech Center, located at 18700 SE Mill Plain Blvd., Vancouver, WA 98683.